Click it I dare you! We at the Doodle Diner would like to thank you for joining in our holiday celebration. We hope it gave you a smile during the holiday craziness!! Remember to check back and see what we’re up to. We love to hear from you! Happy Holidays from The Doodle Diner! 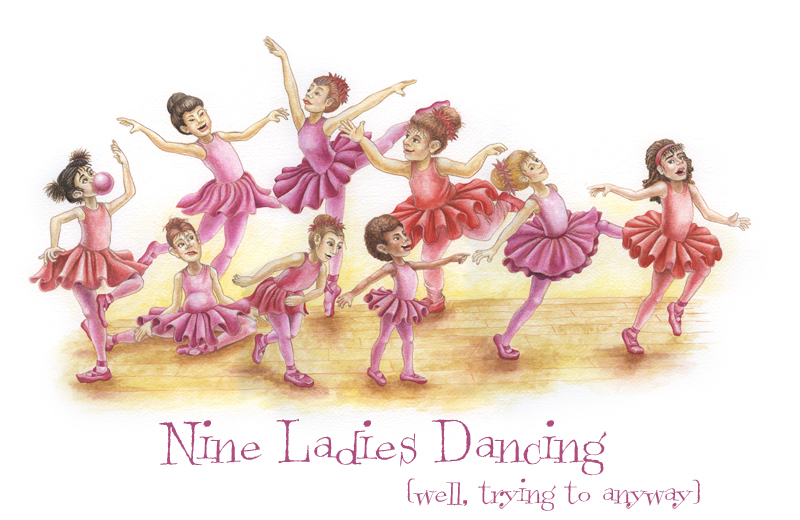 Nine Ladies Dancing… well trying to anyway. Dancing ladies are always so sweet and perfect, unless you go to a dance class when those kiddos are just starting to learn. You get all sorts interpretations of those dance positions. Happy 12 days of Christmas. Meet the Synchronized Sisters of Sunnyvale. These lovely ladies are known far and wide for their beauty, grace and of course their precision technique! Never a more friendly gaggle of gals could be found. That is, until Sylvia joined the group! She was a rare bird indeed!! 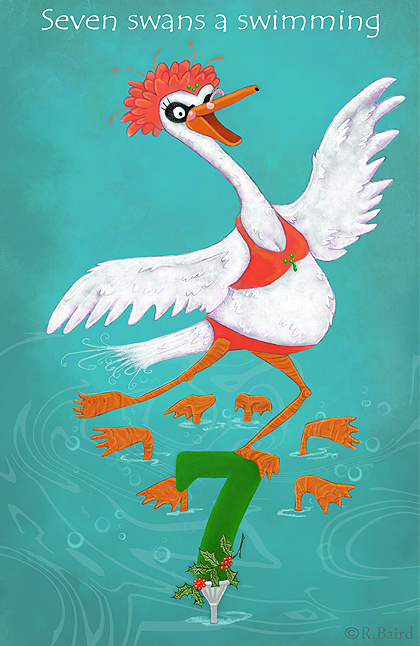 Sylvia just smiled and let it roll like water off a ducks back… or should I say swan! Portnoy had originally planned on sending Priscilla her present by mail. But being a wise pig he decided to do it in person, er porcine. 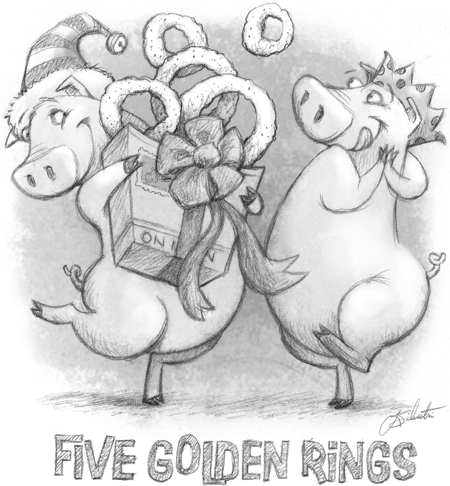 Oh, and seriously, at the end of the day, which golden ring gives you more pleasure, the ore or the onion? The Twelve Day of Christmas continues at the here at the Doodle Diner and we’re having a blast. Stay tuned for more, and if you have moment, check out Day One, Day Two, Day Three, Day Four, Day Six, Day Seven, Day Eight, Ninth Day and Tenth Day. 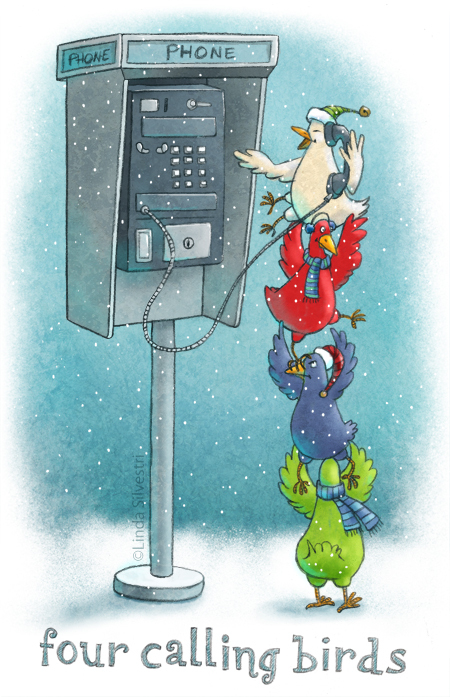 Since neither ATT, T-Mobile nor Verizon will give cell phone plans to birds, our fine feathered friends must resort to the few pay-phones there are left. 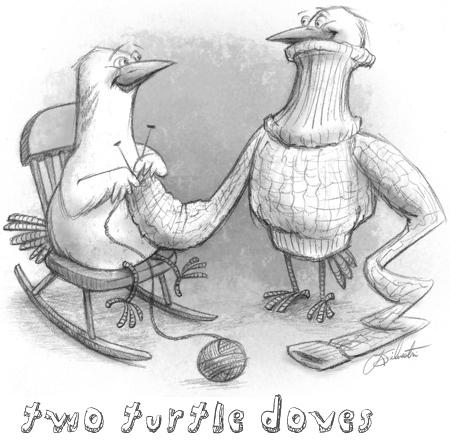 On this second day of Christmas Candace has some fabulous turtle doves winging their way to The Doodle Diner, a wee bit later. 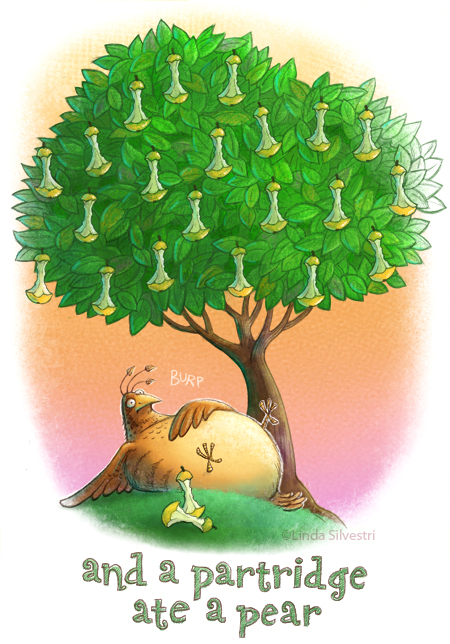 In the mean time, please enjoy this little turtle dove teaser. Sadly, being a partridge, Penelope possessed poor reading skills. So it was only after having trained vigorously to become the next pear-eating phenom that Penelope realized the sign, in fact, read “pie-eating contest”. 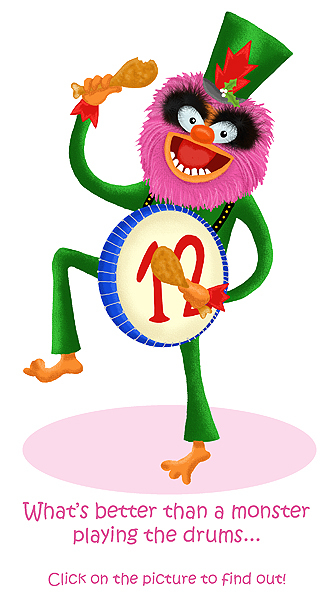 Although the tradition and history of the Twelve Days of Christmas is deep, complex and fascinating and the twelve days typically begin on December 25th and go to January 6th, we at the Doodle Diner decided to break tradition and start our twelve days today and go until Christmas Eve. We’re just rebels like that. So, the Doodle Diner denizens would love it if you would check back each day until Christmas Eve to take a gander at what illustration goodness we have in store for each of the next twelve days. Check out the Second Day , Third Day and Fourth Day. 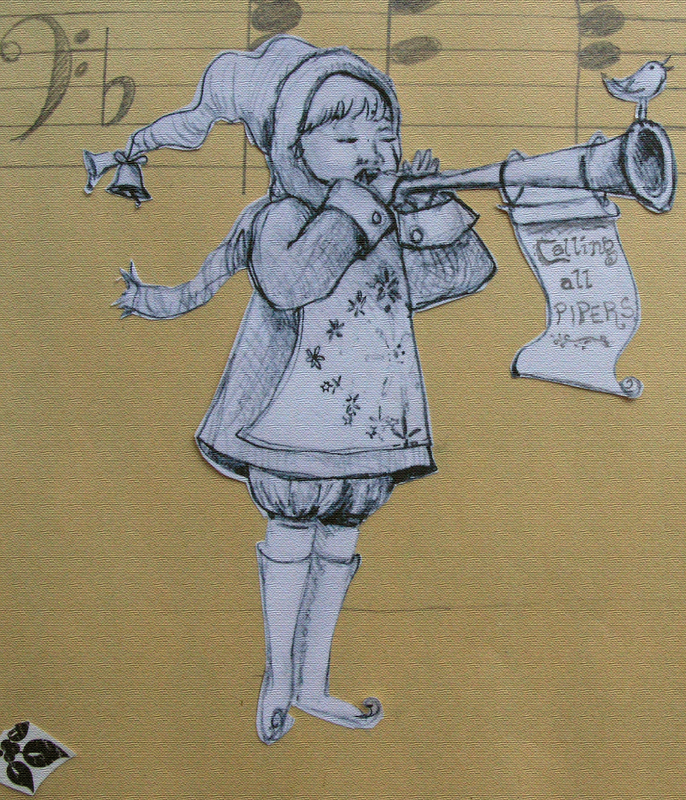 Oh, and make sure to have yourself a merry little Chrismahannakwanza! 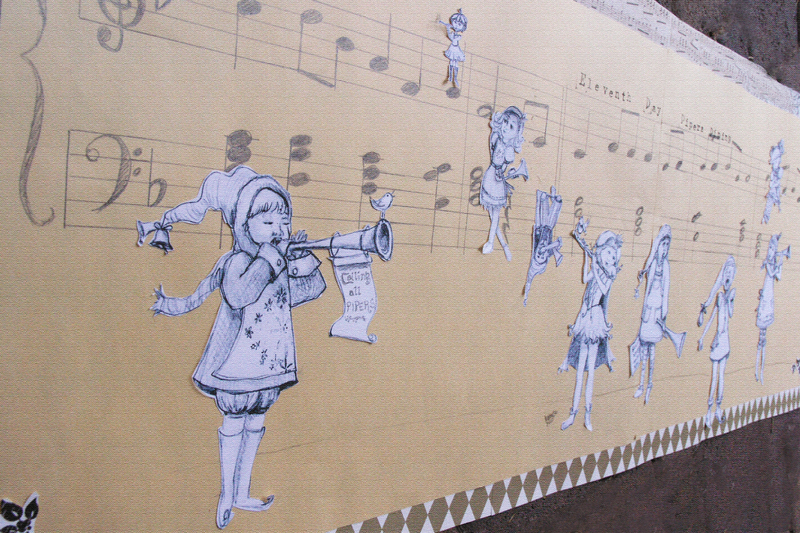 The Doodle Diner is serving up a double dose of doodle goodness and some caroling on the side! 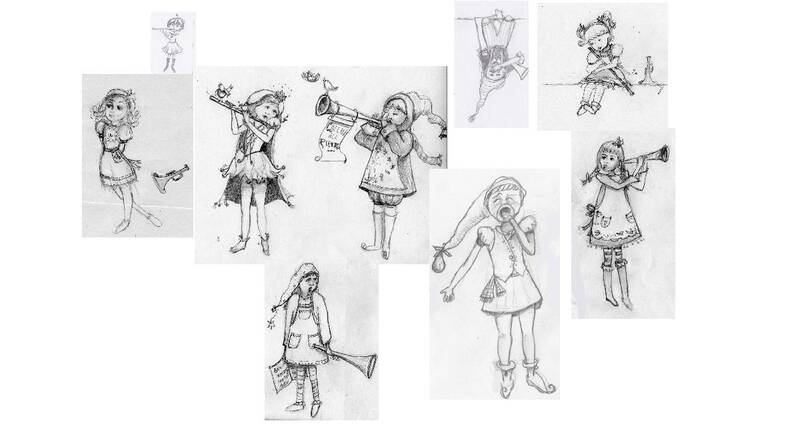 Starting on December 13, 2010 the Doodle Diner will be presenting their own version of the Twelve days of Christmas. Check back each day for a new illustration of an old classic!